Our final Homestudy is in the morning- can I get a WOOT WOOT! We are about to be on BIG step closer to getting our girl:) There is more paperwork to be done, but it is great to get this checked off our list! 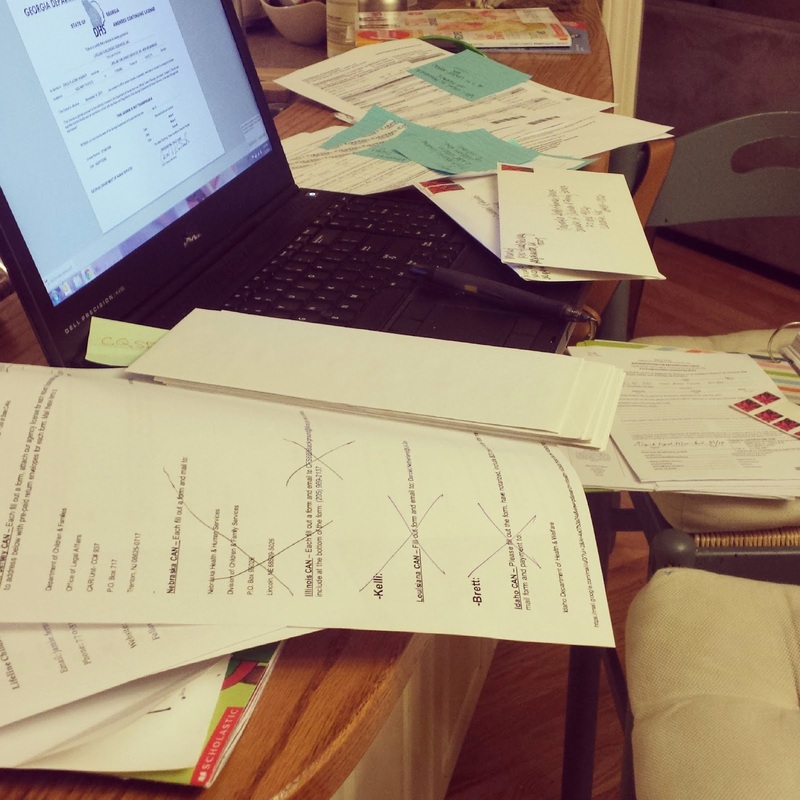 no longer for eating but for "adoption paperwork-working!" We had our physicals last week, boys checkups this week and are finalizing some education/training requirements. We have read books, articles and watched a ton of videos......the good, the bad, the ugly. I feel that we are prepared and well versed in knowledge for what an adoption truly looks like. Like I have said before, adoption is a beautiful thing but it comes from a tragic place. It is amazing to think that she has probably already been born....I daydream about her all the time and wonder how she is doing, what she looks like and where she is. I also have this anxiety in my stomach to hurry and get to her because I know that she is suffering in one way or another by not having the true love and connection of a mother and father. But I keep telling myself that although this seems like a slow process, it is in God hands and His plan is good. The King of Glory, the King of Glory"
And then it hit me why I have had that awkward feeling of saying, "your welcome." You see, you shouldn't be thanking us as we are actually thanking God for putting this on our hearts and providing the resources for us to do so. Don't get me wrong, we do appreciate the kind words. I just want to say that He is the one that placed this on our hearts years ago. We have openly talked about it and privately prayed about it. Last year we started the process and all things have fallen into place. He has provided for us to make this happen. This is for His glory! on my behalf is welcoming me."